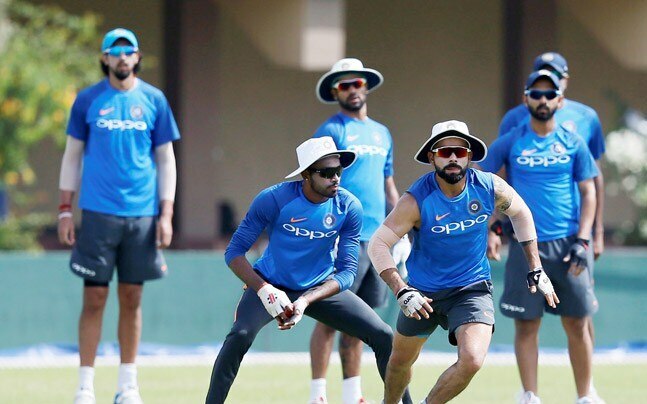 Kolkata, Nov 15: India's first World Cup winning captain Kapil Dev on Tuesday hailed the current team's focus on fitness saying skipper Virat Kohli deserves a lot of credit for that. Kapil, who triumphed in the 1983 World Cup, was speaking at the inaugural Jagmohan Dalmiya Memorial lecture and compared Kohli with the late cricket administrator. "Sourav (Ganguly) told me to talk about the current team also and not only on Dalmiya. Virat has the responsibility to take the game forward as Indians look up to you," Kapil said during his speech with Kohli and the entire Indian team in attendance. "You are a hero and you are like Dalmiya. You can change things. You have done that in the fitness of the current Indian team and that is something which I can be proud of. The Sri Lankan team was also present along with their president Thilanga Sumathipala. The two teams play a Test here in two days' time. "I feel very nervous when I talk about cricket. To my mind, Dalmiya is one of the great heroes we have. One (Kohli) is a hero on the field and the other is off the field. He (Dalmiya) was a hero off the field and what we are enjoying as cricketers today is because of him," Kapil said of Dalmiya who breathed his last two years back. "In the last 50 years in the world, he was the best administrator in all sports. We always used to look up to England and Australia. He used to say we could get wages like them. "It is important to have money on your side. We cricketers play for maximum 10-15 years. Everybody is not like Sachin (Tendulkar). What he did for the game, he is my hero. "At first, he didn't make much of an impression on me. As I kept meeting him, he wasn't the best of speakers but nobody could better understand what is right and what is wrong. He was one of those persons who understood where he can nail down on others and make the deal done," Kapil said. He added that Dalmiya was behind the players getting close to the cricket board back in the 1980s as prior to that the mandarins of the game were not easily accessible and the players feared approaching them. "He could keep everybody happy. He got the players close to the board. In the 80s he did that. Before that nobody could question the board. Half the battle is won for players when the administrator is ready to listen to you. For him love and passion of the game, brought cricketers together. "I don't know inside stories about how cricket was brought in this part of the world but he was instrumental in bringing people together. He used to get things done," Kapil added. Dalmiya served as the President of the International Cricket Council (ICC) and the President of the BCCI in the early 2000s. He was at the helm when the Indian Premier League (IPL) spot-fixing scandal rocked Indian cricket in 2013 and the then incumbent president N. Srinivasan had to step aside. Besides Kapil, former India skipper Mohammad Azharuddin was also present. Azhar captained India to the CAB jubilee tournament Hero Cup triumph. The tournament was Dalmiya's brainchild.